Can EpiBurn by USPlabs Really Hold Up to Its Flab-Busting Claims? Given the numerous positive comments from users, I say EpiBurn Pro is one product worth trying if you’re looking to get rid of fat and make it easier to build the body you’ve always wanted. Getting rid of unwanted flab can be so grueling that it’s not uncommon for people trying to lose them to feel severely unmotivated and drained after just a few days. The worst thing that could happen is you’re going to find it tougher and tougher to keep up with your diet and workout routines. And this could mean totally missing out on the bodybuilding goals that you’ve set. One product that claims to get you back on the right track when this fat loss setback occurs is EpiBurn Pro, which we’ll examine meticulously in a bit to confirm if it really does pull off the whole thing when you use it. How Does EpiBurn Pro Work? Your energy levels and focus are the two main factors that are going to be affected first when you’re trying to shed off unwanted fat. Unless you keep them up to par, achieving your fat loss goals is simply going to be next to impossible. A product of USPlabs, EpiBurn Pro is designed to keep you going even after the harshest workout or the strictest diet plan, which is definitely an advantage if you’re looking to really blast away fat. Editor’s Tip: Check out Bliss Go Pack for an even better option. Caffeine – Besides being a known stimulant that can easily perk you up almost instantly, Caffeine has also been seen to help take alertness and energy levels up a notch. Just imagine how this can help the next time you’re negotiating an extremely challenging workout routine at the gym. Moreover, clinical tests show that Caffeine can enhance the body’s metabolic rate so you’ll burn more fat deposits in a shorter period of time as well. Nelumbo Nucifera (Seed) Extract – Known as “sacred lotus” in traditional Asian folk medicine, Nelumbo Nucifera (Seed) Extract has the ability to inhibit the accumulation of lipids and slow down the buildup of peroxisome proliferator-activated receptor gamma (PPARγ), which can trigger weight gain and even obesity sooner or later if not controlled properly. Coleus Forskohlii (Root) Extract – Classified as a relative of the mint, Coleus Forskohlii (Root) Extract is derived from the Coleus forskohlii, a type of herb that has been used for decades in Ayurvedic medicine as a remedy for inflammations and natural testosterone booster. Experts discovered that Coleus Forskohlii (Root) Extract is packed with an enzyme called cyclic adenosine monophosphate (cAMP), which helped improve the body’s overall metabolic function and increase the intensity of its fat burning compounds. Olea Europaea (Leaf) Extract – Olea Europaea is basically the leaves of the olive plant and was first used medicinally in Ancient Egypt as a folk medicine for strengthening the immune system as well as keeping the heart and blood pressure in tiptop shape. 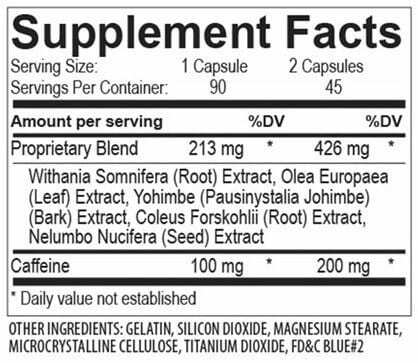 Modern tests show that Olea Europaea (Leaf) Extract is rich in the polyphenol called oleuropein, which has the ability to stave off cognitive decline and keep oxidative damage in the cells at bay. Oleuropein can also help control blood sugar levels that can trigger weight gain if left unregulated. Withania Somnifera (Root) Extract – Primarily known as Ashwagandha in India and its neighboring regions, Withania Somnifera (Root) Extract has been seen to have a role in curbing unwanted food cravings, especially those for the sweet stuff. Excessive sugar intake can lead to blood sugar spikes that will be stored by the body as fat if not burned off as energy fuel. Moreover, Withania Somnifera (Root) Extract also contains natural compounds that can help uplift the mood. Take one (1) capsule of EpiBurn Pro on an empty stomach at least half an hour before breakfast. You can follow up with another capsule after 5 to 6 hours. Do not use more than three (3) EpiBurn Pro capsules in a 24-hour period. Do not take EpiBurn Pro with alcohol and beverages that contain caffeine. Do not use EpiBurn Pro for more than 8 weeks. Drink at least 125 fluid ounces of water daily when using EpiBurn Pro. Based on the user experiences I’ve come across while researching for this review, many people point out that they did not go through any side effects while taking EpiBurn Pro. You can easily discern that EpiBurn Pro is really formulated to help shed off unwanted flab by just checking out the ingredients that it contains. And given the numerous positive comments from users, I say this is one product worth trying if you’re looking to get rid of fat and make it easier to build the body you’ve always wanted. You can click here to grab your very own bottle of EpiBurn Pro right away. Have you tried EpiBurn Pro? If yes, please feel free to share your experience on it below.